By invitation of the UN Foundation, I’m on an observatory trip to Uganda with the Shot@Life campaign delegation to take a first-hand look at UNICEF‘s programs in the country. 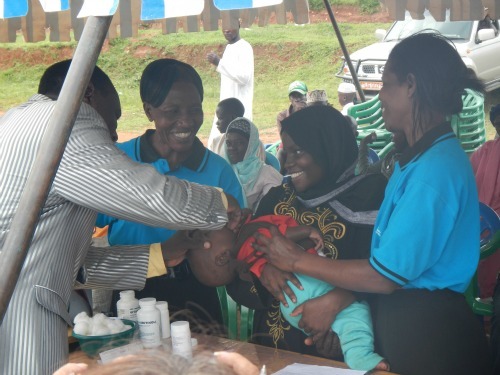 This past July UNICEF began bringing the medicine to the people, instead of trying to get the people to the medicine. 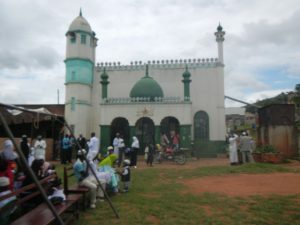 They’ve had great progress in partnering with religious organizations to make this happen because 90% of Ugandans attend a church or mosque every week according to UNICEF. 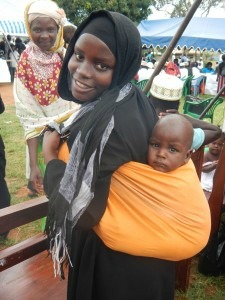 So, our first Family and Child Health Day stop was at Mubende Town Mosque on Day Two. When we first arrived, the people were praying outside behind the mosque. There were too many people in attendance to pray inside the building, especially because it was the holiday of Eid al-Adha. So, we sat and began conversing with some children near the health tents. We asked them their names and their ages, and we asked them about school. Fellow Shot@Life champion, Jenny Eckton, and I were swarmed with children. We took out our cell phones to show them pictures of our own kids, and they were also excited to see pictures of the Atlantic Ocean that I had taken when my daughter was searching for seashells. The praying ended and the people came back around to the front of the building. 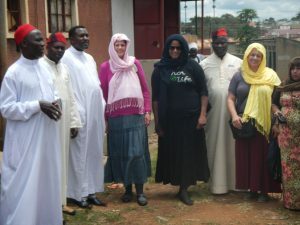 We were greeted by town officials, as well as the Imam and his religious officials with open arms. They were excited to tell us about the Family Health Day that was occurring. They said that there are over 120 mosques in the area and over 70 were having health services today. UNICEF’s Child and Family Health Days provide children with Vitamin A tablets to help prevent blindness, polio and measles immunizations, deworming tablets and insecticide treated bed nets to help prevent malaria. At this location they also gave adults blood pressure, diabetes and HIV testing. The mothers proudly brought their babies up to be vaccinated. Vaccination for the four leading causes of death in children under 5 years can mean the difference in life and death for a child. This was the most important part of our observation because World Moms Blog has been championing for the health of children through vaccination for over a year now. We got to see where they worshipped inside, and where the imam lived — a small building connected to the mosque. The holiday included slaughtering live animals to share with their members: cows and goats. I looked away, but later saw the meat being hung on the tree. The men cut off pieces, and members lined up with bags to take some home. For someone who is not used to seeing where her meat is coming from, I have been eating vegetarian ever since. The people were super friendly, and the mothers once approached were curious and excited to talk with us. The children were everywhere and wanted us to take their pictures. The mothers lined up to take their kids to the health stations. We were all bonded in our shared the wish for their children, all children in the world, to be healthy. World Moms Blog Founder, Jennifer Burden, was in Uganda as part of the Shot@Life delegation to the UNICEF offices in Kampala. 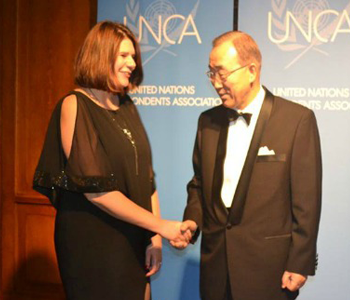 What a truly amazing experience, Jen! Thank you for following the Shot@Life trip from Malaysia, Alison! I am so loving the practicality of the approaches you have spoken about – bringing the medicine to the people is so sensible. As for the reality of seeing recently slaughtered meat – it does make you realise how separate so many of us are from the cycle of life, doesn’t it? Yes, that was really difficult. I must admit, I’m back to eating some meat, although I am still eating mostly vegetarian! The trip was amazing, and I still have so much to write! Thank you for following the trip from New Zealand, Karyn! I totally agree with what Alison & Karyn have said. Absolutely! Could not agree more! I love reading your posts and learning from these amazing experiences you are living right now! 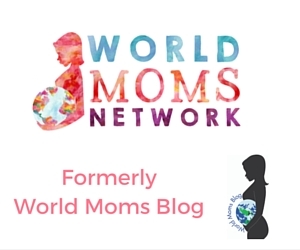 I was so proud to represent you all at World Moms Blog!! Like Alison said, this sure must have been an amazing experience for you. Isnt that what all mothers all over the world want – for their children to be safe and healthy..?!!! I am glad WMB was part of the campaign championing healthy kids through vaccination. We had a great session where we sat down with a mother’s group at a local church. I can’t wait to write all about that, Purnima! Thank you for following from India! Thank you! I was so proud to be a part of it all. Look out for more posts! Jen, being with you that day is a memory I’ll never forget. Thank you for reviewing the day’s experiences so wonderfully.